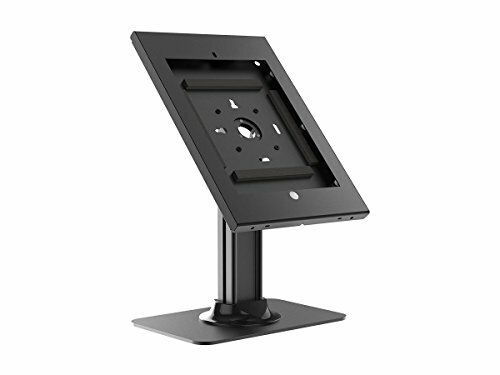 Safe and Secure Tablet Desktop Display Stand for 12.9 iPad Pro, Black This secure iPad mount is built for easy access, and public settings while protecting your tablet. It is ideal for kiosks, businesses, schools, dorms, retail, offices, lobbies, hotels, hospitals, events, etc. The lock and key feature keeps this enclosure safe and secure. The anti-theft and anti-tamper design suits a wide array of applications for security purposes. The case holder is built from steel to prevent breakage or tampering. The slim profile and elegant design keeps this iPad enclosure sleek and contemporary. You can feed chargers or other accessory cords through the openings on the enclosure. The 90 degree pivot can place your display in portrait or landscape. The tilt function can bring your tablet from facing straight up to tilted forward 75 degrees. This creates an ideal combination of ease-of-use and comfortable viewing orientations. Compatible with the 12.9" iPad Pro. The case holder is built from steel to prevent breakage or tampering. The slim profile and elegant design keeps this iPad enclosure sleek and contemporary. You can feed chargers or other accessory cords through the openings on the enclosure. The 90 degree pivot can place your display in portrait or landscape. The tilt function can bring your tablet from facing straight up to tilted forward 75 degrees. Compatible with the 12.9" iPad Pro.